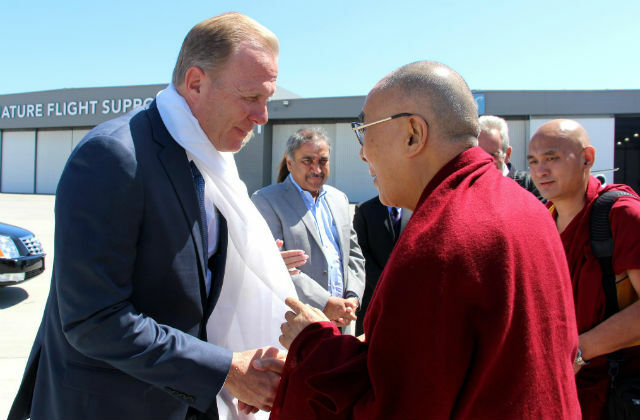 San Diego Mayor Kevin Faulconer greeted the Dalai Lama Thursday morning after he landed at Lindbergh Field on the first stop in a visit to the United States. The mayor greeted His Holiness as he arrived on the tarmac and will introduce him Friday before his public talk at UC San Diego. “As a city that celebrates its diversity, spirit of collaboration and environmental leadership, we are proud to welcome one of the world’s great champions for peace and understanding to San Diego,” Faulconer said after the meeting. “His Holiness the Dalai Lama is an inspiration to people across the globe and we are honored to have him return to our city,” Falconer added. The talk on Friday morning at UC San Diego’s RIMAC Field is titled “Embracing the Beauty of Diversity in our World.” The Dalai Lama will address the university’s graduating class on Saturday. Tenzin Gyatso, the 14th Dalai Lama, was awarded the 1989 Nobel Peace Prize for his nonviolent struggle for the liberation of Tibet. He also became the first Nobel laureate to be recognized for his concern for global environmental problems.